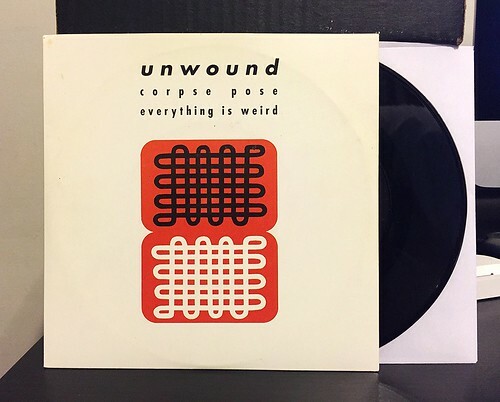 I Buy Way Too Many Records Dot Com: Unwound - Corpse Pose 7"
Unwound Wednesday! By the time 1996's Corpse Pose 7" came out, I wasn't listening to as much Unwound as I had the past couple of years. I was actually starting to burn out on a lot of that Pacific Northwest scene and had had my fill of bands like godheadSilo and Karp. I was moving on to focus on poppier bands at the time, but in doing so, I really missed out on some killer Unwound songs. "Corpse Pose" is just quintessential, brooding Unwound. The steady bass line and drumming provided a really strong canvas for Jostin Trosper's guitar antics. The verse is a bit more upbeat than the chorus, but the way the song just kind of freezes for the repetition of the phrase "corpse pose" in the chorus is some pretty masterful songwriting. It's deceptively simple, but extremely effective. B-Side "Everything Is Weird" is equally great. It's a bit more fast paced and punk driven, but it maintains the more mature elements that Unwound had been bringing into their records. Just like "Corpse Pose," the bass lines just holds the whole song together and really stand out as being something special. Granted, I had been listening to these two songs a bit more regularly due to their inclusion on the most recent third Unwound box set that came out, but it's still pretty great to add the original 7" to the collection.